Notice that we're not very strict parents. Most of the things that he plays with don't really get damaged. But paper products, food, and balls of yarn are not some of those things. After about an hour of non-stop movement, I decided that maybe a long walk was in order. So we all went. No day is complete for Ray if he doesn't get to meet new people and/or dogs. This day was no exception. 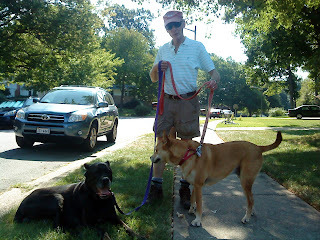 On his walk, Ray met John with his two dogs Boomer and Zooey. Boomer, a Chow mix, took to Ray just fine. Zooey, a huge Italian Mastiff, not so much. Ray was crushed, as he usually is when his charm fails him. I think he should have tried the tried-and-true Ray technique of yelling in her ear. Gets 'em (almost) every time. Or makes them deaf, whichever comes first.